KATIE: Are you ready, Waffles? WAFFLES: How long's the car ride again? KATIE: 13 or 14 hours. About 932 miles. WAFFLES: That's a long time in the car, Boss. KATIE: Exactly. That's why I asked if you're ready. So. Are you? Today's the day! (Well considering we write and publish our blog post the night before, that means for us, tomorrow's the day.) Waffles, Katie and Glogirly are road-tripping their way back to Minneapolis for a visit. Glogirly packed up the car last night with all the essentials - Portable litter box, cat beds, cat blankets, cat toys, cat food, cat snacks... There was barely enough room for her underwear and shoes. 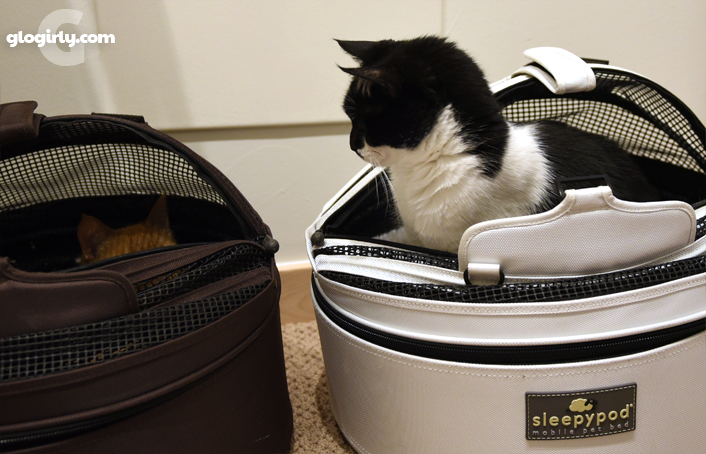 Not to worry, she made it all fit with plenty of space for Katie and Waffles' Sleepypods. With so many miles ahead, it was lights out early last night. The plan is to leave just before the sun is ready to peek over the mountains and drive the whole way, that is as long as Glogirly feels rested and doesn't get tired. But we've already got a hotel picked out in case we decide to stop for the night. 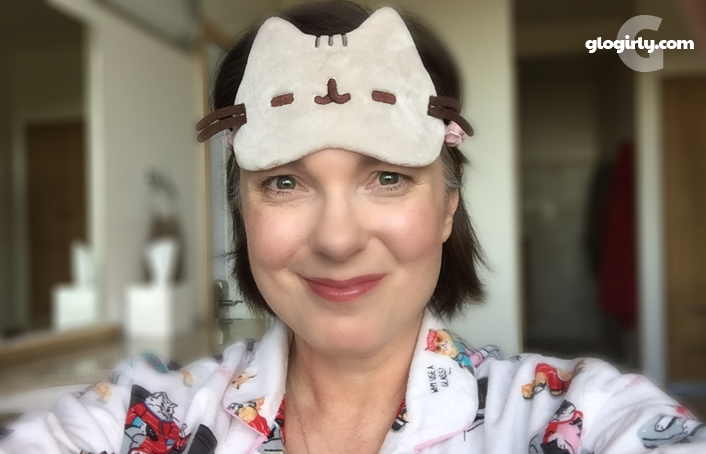 It was still pretty bright out when everyone went to bed, so Glogirly donned her cat sleep mask. And of course, her flannel cat pajamas. She always sleeps better when she's surrounded by cats. Have a safe trip! And DO stop at a hotel if you get tired. I know my human would make it a two-day trip because she can't drive that long without getting really tired. You look wonderful Debbie! Have a good trip! Kitties, be sure to sing and talk to keep Glogirly awake. 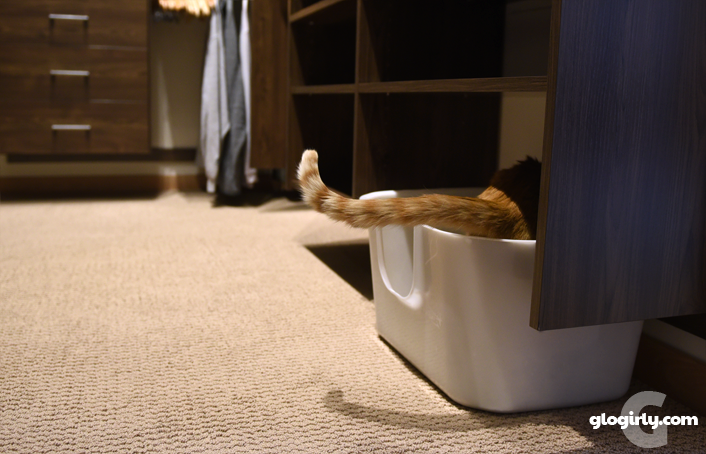 Mom one day want's to see a picture of your portable litter box. safe travels to visit Gloman!! We did a super-long drive like that once too. Yuck! Good luck. That's a long way to go without a sleep, so we hope you stop if you need to! Good luck! Have a safe and fun trip and visit. I need that sleep mask. Where can I get one? Have a safe trip, you three! We hope your trip has been uneventful! Safe travels, guys! Enjoy your stay with Gloman! TW needs those pajamas! Her cat pj's are threadbare.